#Senate Dems were successful, in a party-line vote, in defeating an effort to negotiate with the House to fund the government. As expected, the Senate moments ago rejected the House’s latest spending proposal which, like its others, had amendments that would have altered Obamacare. The Senate also has spurned a GOP call to set up a conference committee that would seek a compromise in the stalemate. In a letter to federal government workers, President Obama says that "none of this is fair to you." "I want you to know that I will keep working to get Congress to reopen the government, restart vital services that the American people depend on, and allow public servants who have been sent home to return to work," Obama wrote. An actress and an IT consultant talk about how they feel about the shutdown and Congress. "It's essentially (like) when you go to ... day care and you pick up your children and you see toddlers squabbling," IT consultant CC Stinson told CNN. 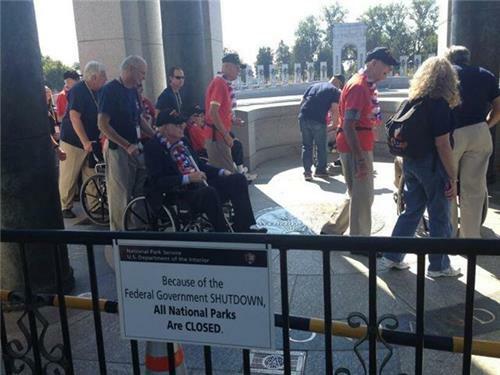 Shutting down the government is deadly serious. Republicans seem more interested in organizing stunts with empty chairs. Former Sen. Olympia Snowe, a Republican from Maine, says the shutdown is just the latest example of the two parties not working together to solve the nation's problems -- something she says prompted her to leave the Senate in January. She also says that she doesn't recognize her own party. "I would urge people to get involved right now. ... Weigh in with your lawmakers," she said. Here's a slideshow of various Twitter reactions relating to the shutdown. Can we just shut down Congress and let the rest of the government stay open? The shutdown failed to rattle investors. Dow adds 61 points. Nasdaq climbs 1.2%. S&P rises 0.8%. Since midnight, 2.8 million visits to HealthCare.gov and 81k calls. Millions want to #GetCovered . 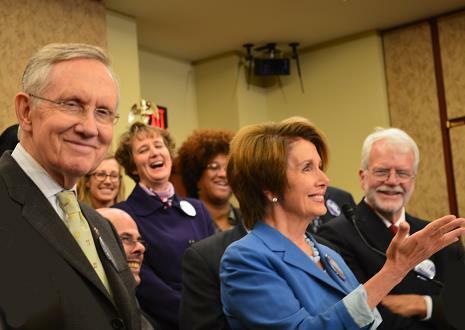 on sen floor right now - @SenatorReid - responding to House Republicans latest idea - expect him to say NO. Republicans are now trying to cherry-pick a few parts of the government to keep open. We won't pick and choose. We must re-open all of govt. Carney said WH can't "call out the Natl Guard" to end shutdown. But guard hit w furloughs too. 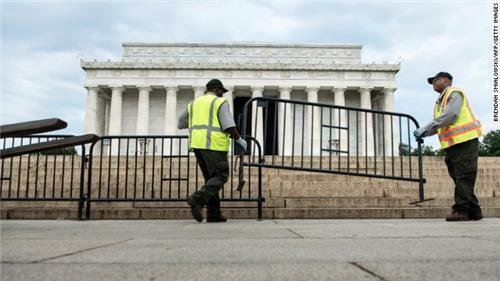 Federal workers who lose pay during the government shutdown can fall back on unemployment benefits in most states. But the money comes with a catch, CNNMoney reports. If Congress decides later to retroactively pay those workers, they would have inadvertently double-dipped into the system and will be asked to return the money. Is losing the governorship of Virginia going to be part of the price of this govt shutdown? Boehner spox @michael_steel notes Obama signed bill sparing soldiers but not vets, parks: "The WH position is unsustainably hypocritical." "Ted Cruz is a fraud" says Congressman Peter King on #outfront , "we have to stop listening to Ted Cruz". Will the markets continue to shrug off the shutdown? Chatting with @KateBolduan tomorrow morning about the progress between the house and the senate is @WhipHoyer . What questions do you have? On #NewDay we're talking to a couple that has been affected by the #shutdown in a different way - they have to change their #WEDDING plans. CDC had to furlough 8,754 people. They protected you yesterday, can't tomorrow. Microbes/other threats didn't shut down. We are less safe. Can I officially name this #ShutdownWedding ? This is whats wrong with America: they shut down their government and vote off Bill Nye from dancing with the stars, all within 24 hours.